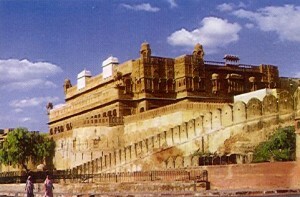 This fort is built in 1593 A.D. and is a formidable structure encircled by a moat and has some beautiful palaces within. These places, made in red sandstone and marble, make picturesque ensemble of courtyards, balconies, kiosks and windows dotted all over the structure. The main entrance to the fort is the Suraj Pol or Sun Gate. Among the notable of these places are the beautiful Chandra Mahal with marvellous paintings, mirrors and curved marble panel, the Phool Mahal or flower palace ornate with glass and mirror work. Other palaces are the Anup Mahal, Karan Mahal, Dungar Niwas, Ganga Niwas, Gaj Mandir and Rang Mahal. Gigantic Columns arches and graceful screens adorn the palaces. This entry was posted in Junagarh, Rajasthan and tagged Fort, fort junagarh, forts, junagarh india, rajastan fort. Bookmark the permalink.